Imagine a place where the city shoots shadows into the sea. Where white sand beaches disappear into bright blue waters, and bright blue waters fold into some of the best waves on earth. Where the food is healthy and the people kind. Imagine songbirds singing and palm trees swaying in the breeze. Now, imagine it ain't all cliche - there's a balance to everything we just brought up. Imagine this place has nightclubs and pies stuffed with meat and gravy. Imagine parties every nights, imagine casinos. Imagine seeing the sunrise for all the wrong reasons. Stop imagining now - too much of that will turn you into a deadbeat or John Lennon. This place exists. It's called the Gold Coast, though it may be easier for you to refer to it as your next trip. Ever felt an itch to push around that next corner? Or the childlike wonder that urges you to climb a hill, just to see what life looks like on the other side? Or an undeniable desire to explore every crevice of the globe? Well then, you came to the right place. Boardriding gives us a reason to satisfy that desire. It gives us somewhere to go and something to do when we arrive. And, best of all, it opens up doors around the world. Nothing breaks down barriers quite like boardriding. That's what Radical Times is about. We want to inspire you to chase fun around the globe and we want to empower you with the information you need to do it. 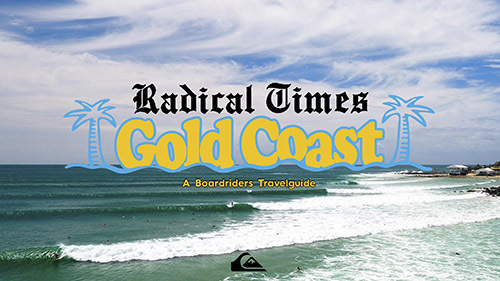 So, here it is: your Boardrider's Guide to the Gold Coast. Now it's up to you to use it.